I had both driving to do and time to kill, so as I prefer to do, I broke up my travel by tagging some semi-random peaks along the way. None was interesting enough for a long writeup, so here they are in a single pile. Mount Patterson is the highpoint of a distinct mound of mountains north of Bridgeport near the California-Nevada border. It is not particularly impressive, with a jeep road nearly to the top, but its isolation does give it over 4000 feet of prominence, and it was not too far out of my way. For those with normal-clearance cars, it is most easily reached from the long dirt road to Lobdell Lake, which was more of a large mud puddle when I saw it. I drove halfway in the night before, then finished the drive in the morning, partly because I didn’t want to drive the rougher part of the road at night, and partly to blast the heater on a cold morning. I parked on the south side of the “lake,” then hiked across the earthen dam to join the jeep road leading toward Patterson. I met some hunters on their way down in a quad, but otherwise had the path to myself as I hiked up a hillside, through a canyon filled with turning willows, and finally switchbacked up a slope to the plain below the summit. There was a sign describing the precious tundra, and instructing motor vehicle enthusiasts not to drive on it. There were pleasantly few off-road tracks, though I suspect this was more because few people drive here than because the ones who do are better-behaved than average. I found bits of crusty snow on the road, and a bit of rime on the summit, reminding me that my season is unfortunately ending. While I was comfortable hiking up, a cold wind on the summit soon chilled me and made my hands clumsy. I had been thinking of tagging some neighboring peaks, but after a quick look over at Nevada, I decided that I had had enough cold for the day. 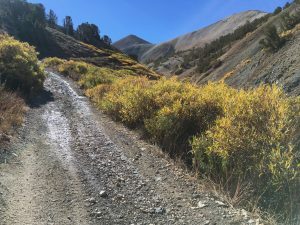 I hiked and jogged back toward the car, stepping aside on the lower climb to allow several souped-up jeeps to pass, a couple towing burly off-road trailers. There were a couple more waiting at the sign at the bottom, and one of the occupants asked if I was okay. I suppose he thought I might have broken down, and when I explained that I was just out for a hike, I could see him asking himself “why?” Walking a jeep road is indeed silly, but sometimes it happens. Black Hawk was one of my two remaining SPS peaks in the Sonora Pass area. 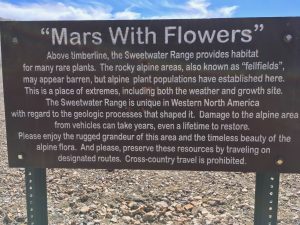 It is a moderately long hike from Kennedy Meadows, around 20 miles round-trip, starting along a horse-ravaged trail and ending with a long cross-country climb past Lewis Lakes and Black Hawk Lake. 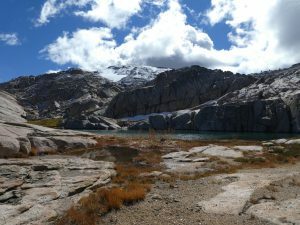 It sits amidst an interesting mix of rolling Sierra granite and black volcanic choss, with its summit made of the latter, but much of the approach of the former. 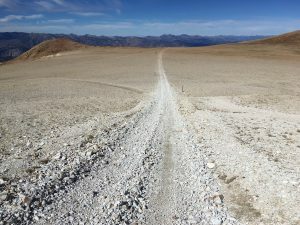 The trail up to Relief Reservoir, which may once have been a wagon road, has been beaten to death by pack traffic, but the recent rains had fortunately subdued the dust. 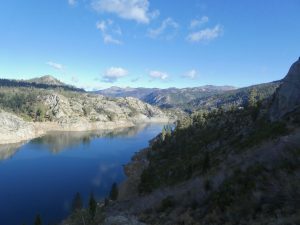 The trail slowly improved as it went around the reservoir, then climbed southeast along Summit Creek. Based on some tracks downloaded from Peakbagger, I left the trail at a semi-random stream junction, then flailed around in the granite slabs and woods, going too far west before making my way around one of the scenic Lewis Lakes to get back on track. I found traces of an old trail, and a “no fires above here” sign, but the terrain was otherwise trackless and confusing. The flatter areas not filled with lakes were mostly willow-choked bogs, though I fortunately managed to mostly avoid crossing them. Black Hawk Mountain has a distinctive permanent snowfield north of its summit, and the track I was following climbed the granite slabs to its left. However, with a dusting of snow lingering up high, it looked easier to me to climb the broken volcanic stuff to its right. Though most of the sky was clear, there was a persistent cloud shadowing the summit, so I did not stay long. Finding no register, I took a few photos, then returned toward Summit Creek, this time taking something more like the correct line. The clouds began looking more serious as I hiked and jogged toward the trailhead, but it fortunately never rained or snowed. I reached the trailhead mid-afternoon, then returned to 395 to head north.